We have two vacancies within our Team. Hours: 37 hours per week. Holidays are 23 working days pro rata, per annum (increasing annually to a maximum of 28) plus 8 Bank Holidays. 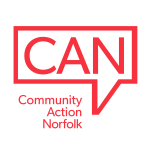 You will be at the heart of CAN’s busy office environment supporting our work with voluntary sector and other partners across the county. The Admin Officer will be responsible for undertaking a broad range of administrative tasks, including office, secretarial and project support. For more information please read the full job description here. The primary focus will be on developing Good Neighbour Schemes, alongside other community-based projects. Essential skills include good communication, diplomacy and organisational ability, along with problem-solving, patience and empathy in finding solutions to community needs. Knowledge of the VCSE sector and health and social care will also be helpful. A supporting statement of not more than 2 pages of A4 with a minimum of size 11 Arial. The supporting statement should respond to the core competencies of the role and how you think you meet these. Full details of these can be found in the above job descriptions and the Candidate Brief, available here. A comprehensive CV, please address any gaps in employment or education history. An equal opportunities monitoring form, available here. Please send these to [email protected]. For more information about the roles please contact Jon Clemo on 01362 698216.